WHAT DO YOU GET WHEN YOU COMBINE FIRE AND WATER? A YOGA EXPERIENCE LIKE NONE OTHER. Our two dedicated yoga studios prove that fire and water can live together. With the area’s top instructors, our yoga will truly challenge and revitalize your mind, body and spirit. Grab a mat and come find your Zen. Our FIRE STUDIO is dedicated to hot yoga and pilates, and features an infrared heating system and a Himalayan salt wall—both of which are renowned for their detoxification and healing properties. Our WATER STUDIO is a calming sanctuary dedicated to flow (also known as vinyasa), gentle, and yin yoga. Pilates and yoga classes in the Water Studio will allow you to find fluidity throughout your body. Elements Foundations caters to beginning students and focuses on the basics. We welcome both brand new and returning practitioners, as well as more advanced yogis who want to work on beginning poses. You will be guided through the fundamental principles of alignment and breath. Usage of props is encouraged to help poses be accessible for all abilities. Emphasis will be placed on understanding of one’s body, safety, and stability throughout class. With consistent attendance, you will be able to confidently progress into our flow classes. Elements’ Gentle Flow is designed for beginners through intermediate students. In Gentle Flow, you’ll be guided through postures in a Vinyasa style, beginning with the basic poses, but allowing for more challenging poses based on your practice level. Props are encouraged to allow the body to fully achieve each pose comfortably. This is a great class for students looking for a more gentle experience, those who are new to yoga or those who need a change of pace, yet still have the option to take it to the next level. Also the perfect class for students with injuries or limitations. This class is scheduled in our Water Studio. Light to no-heat. 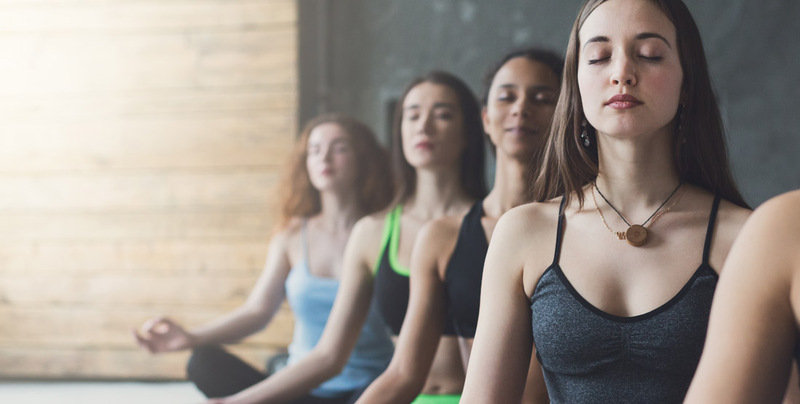 Elements’ Fire Flow Yoga (Vinyasa) is a powerful, energetic form of yoga where students fluidly move from one pose to the next while connecting their breathing to their movements. This type of yoga is taught in a heated studio, which makes it a vigorous and revitalizing form of physical fitness. It incorporates strength, flexibility, balance, cardio, and physical and mental stamina in one session. Vinyasa, meaning, “flow” or “to move without resistance,” incorporates interval and cross-training exercises to challenge both the aerobic and anaerobic systems of the body. As your body adapts, it is important to vary the types, intensity and duration of the exercises. Power Vinyasa yoga incorporates regular sequences that become familiar to students, but incorporates variations to modify, intensify or challenge the body by altering the pace or duration of poses, and the frequency that they are repeated. This class is held in our Fire studio with temperatures of 90+ degrees. Elements’ Pilates com­bines car­dio and mus­cle ton­ing in a lightly heated room. The high inten­sity inter­val train­ing keeps your heart rate up, help­ing you burn fat. The Pilates prin­ci­ples sculpt your body, cre­at­ing long, lean mus­cle mass. The light heat loosens up the mus­cles quickly and the humid­ity makes you sweat — ele­vat­ing your heart rate, boost­ing metab­o­lism and pro­mot­ing detoxification. Pilates cre­ates long, lean mus­cle mass, burns fat and increases fit­ness lev­els. It cre­ates a stronger core, improves cir­cu­la­tion, and increases flex­i­bil­ity. It is per­formed on a yoga mat mak­ing it zero impact, pro­tect­ing your joints and mus­cles from the pound­ing of other exer­cises like run­ning and jumping. This class is held in our Water studio with temperatures of 75-80 degrees. Elements’ Inferno Pilates com­bines car­dio and mus­cle ton­ing in a heated room. The high inten­sity inter­val train­ing keeps your heart rate up, help­ing you burn fat. The Pilates prin­ci­ples sculpt your body, cre­at­ing long, lean mus­cle mass. The heat loosens up the mus­cles quickly and the humid­ity makes you sweat — ele­vat­ing your heart rate, boost­ing metab­o­lism and pro­mot­ing detoxification. Hot Pilates cre­ates long, lean mus­cle mass, burns fat and increases fit­ness lev­els. It cre­ates a stronger core, improves cir­cu­la­tion and increases flex­i­bil­ity. It is per­formed on a yoga mat mak­ing it zero impact, pro­tect­ing your joints and mus­cles from the pound­ing of other exer­cises like run­ning and jumping. Elements’ Slow Flow Vinyasa Yoga allows beginners to create their own synchronized dance, while learning poses and how to move, breathe and stretch between poses. Slow flow brings the element of time into the practice. Slow flowing Vinyasa is a wonderful practice in discovering one’s personal limitations and learning how to move past those limitations. Slow Flow Yoga is not restricted to beginners or those with physical limitations. All levels of Yoga practitioners can find their personal challenges, as they slowly and mindfully move through a series. The pace may be slower, but challenges will be present with difficulties to work through. Slow flow allows a person to become familiar with his or her body, create a reflective pause and create the time to go inward. Slow Vinyasa Yoga is a therapeutic dance of moving meditation. This class may be either in the Fire or Water studio respectively. Please check the schedule! Elements’ Fire Yin yoga is a beautiful, still practice and is the perfect compliment to Vinyasa style classes, cycling and climb. Focusing on ligaments, tendons, joints, bones and fascia; poses are held for 3-5 minutes to get past the muscles and into these areas. Although poses are simple in nature, the challenge arises in staying in these poses when the mind begins to wander or resist. This meditative practice provides tools to deal with uncomfortable poses on the mat so that stillness can be cultivated off the mat. Now…add 90+ heat in our Fire studio! Elements’ Vinyasa class will emphasize the flow of movement with breath. A focus on alignment will create accessibility for mixed levels of practitioners, and provide an opportunity for students to build strength with basic asanas, and find freedom and flexibility with smart sequencing to peak asanas. This class is located in our Water Studio. Elements’ Yin yoga is a beautiful, still practice and is the perfect compliment to Vinyasa style classes, cycling and climb. Focusing on ligaments, tendons, joints, bones and fascia; poses are held for 3-5 minutes to get past the muscles and into these areas. Although poses are simple in nature, the challenge arises in staying in these poses when the mind begins to wander or resist. This meditative practice provides tools to deal with uncomfortable poses on the mat so that stillness can be cultivated off the mat.